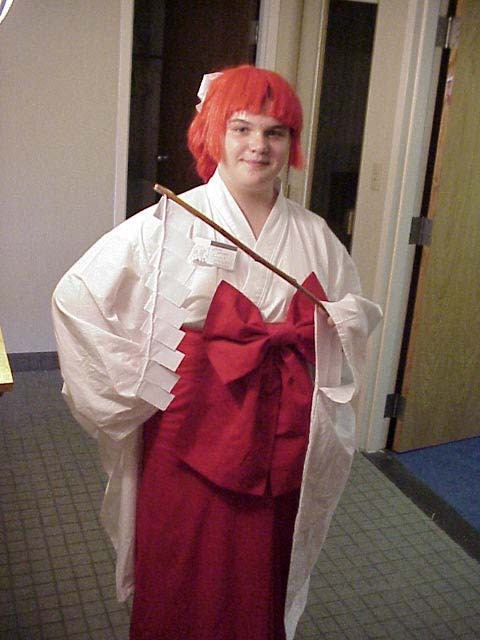 When I first learned there was going to be an anime convention in New Hampshire, I got pretty excited. The northeast had always gone without any anime conventions while places like Virginia and Texas get more than their fair share. With such a large anime fanbase in the area, I couldn't figure out why nobody had organized a convention before. Fortunately, Ray Biondi organized such a convention...Mikkakan. The name, "Mikkakan", is Japanese for "three day event". When I mailed in my pre-registration for Katsucon, I decided to mail in Mikkakan at the same time. Little did I know that I'd be the first pre-registrant. This made the Mikkakan staff insanely happy. When I met them at Katsucon, they were all excited and even gave me NECCO wafers. After e-mailing some comments on the costume contest, I got sucked in and ended up as a judge for the contest and a panelist on the costuming panel. I was glad to lend a hand and wanted to help this first-year con become a success. Later on, I volunteered to host "Whose Line Is It Anime?". 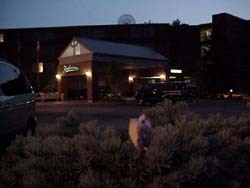 The convention was held at the Radisson in Merrimack, NH. It's a nice hotel that was remodeled recently. Mikkakan had five rooms and a con suite reserved. They originally had the ballroom reserved, but due to double booking with a wedding, that wasn't available. Friday, June 15th was a very hot and humid day. It was unpleasant to be outside, but fortunately the hotel was air conditioned. After finding the registration desk, I headed up to the staff room in the con suite to change into my Ferio costume. I had missed Tristan MacAvery's panel, but I got to listen in on the last half of Neil Nadelman's. Neil is a translator who has worked on projects such as Slayers, Utena, Wings Of Honneamise, and Macross Plus. He shared some of his insight about working on translations and some of the problems that tend to come up because of quirks with the English language. Neil's panel was followed by a panel hosted by John Barrett, the artist of Gold Digger Edgeguard. He was soon joined by Jen and Becky from Estrigious Studios. John specializes in anthropomorphic art and told the audience that a lot of the stuff in Gold Digger Edgeguard was inspired by Thundercats. Jen, Becky, and the rest of Estrigious Studios met while they were attending the School of Visual Arts in Manhattan. They decided to form their own studio to help promote their work. Although they're a group, they usually work independently. When asked what kind of anthro they'd be, Jen said a slug and drew a cute little slug on the whiteboard. John said a cat and produced a drawing of Roxikat sitting on his head. Becky said she's never really drawn anthro art, but she had to play a bat in a play once. I cut out of the panel early to get ready for the costuming panel which was up next. 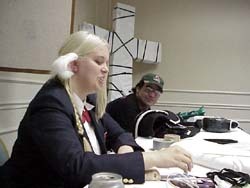 The costuming panel was hosted by myself, Mike Ray, and Mikka-chan (the con mascot). We each brought some sample costumes and props we've created as well as samples of materials we've used. We shared experiences we've had in costuming and answered questions from the audience that they might have had about costuming. Mike brought armor from his Legato costume, Wolfwood's cross, and other props. Mikka-chan showed off her mascot costume. The ears were made with model magic and attached to wraparound headphone ear pieces which were attached using spirit gum. When she wiggled her ears, the cat ears wiggled too. I brought my Ferio sword and an assortment of props. 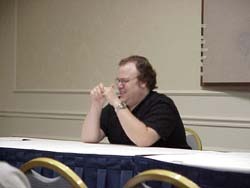 After the panel, I headed up to the con suite and relaxed with free chips and soda. Mike started up karaoke with his impressive music collection and got people lining up to sing. I headed downstairs and ran into Adam Ferraro, a friend from Anime on DVD's forums. While we talked, we learned that Mikkakan had hit 150 attendees by 6pm. That was about what they estimated for the entire weekend and Saturday was sure to bring even more! Adam and I talked for a while and headed into to watch "Adventures of the Mini-Goddesses in the Handy Petite Size". I'm not sure why I watched it since it's my tape. Then again, it's always fun to watch. I left there about halfway through to get ready for "Whose Line Is It Anime?". I had been looking forward to hosting that all day. After soliciting the con suite for "audience suggestions", I headed downstairs again to set up the room. I wish I had pictures of this event, but since I was busy hosting, I wasn't able to take any. If anyone has photos online, please let me know! "Whose Line is it Anime?" was a take-off on the popular "Whose Line Is It Anyway?" TV show in which four comedians need to improvise to the given game. Our four contestants were Tristan MacAvery, Neil Nadelman, John Barrett, and Mikka-chan the con mascot. I hosted it while still dressed as Ferio. In one of my favorite games, "Party Quirks", one of the contestants has to host a party which is attended by the other contestants. At the end, he has to guess who they were pretending to be. I had John Barrett host the party. Tristan had to be "an obsessed fanboy determined to get an autograph", Neil was "someone addicted to Dance Dance Revolution", and Mikka-chan was "Tristan MacAvery". The crowd had a pretty good laugh when they saw that Mikka-chan had to imitate Tristan. I'm looking forward to hosting another episode of "Whose Line Is It Anime?" at next year's Mikkakan (if there is one). Soon after "Whose Line...", went to dinner with some friends and then headed home. I had some last minute costume preparations to make for Saturday. I arrived a bit late on Saturday since I was up late working on my costume. When I arrived, the "Running an Anime Web Site" panel had already started. 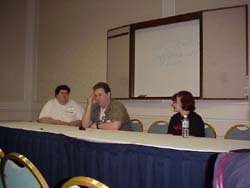 It was hosted by Chris Beveridge of Anime on DVD, Mike Toole of Anime Jump, and Mara K. of Girl Germs. They shared their insight on creating, hosting, and running a Web site. Even though the information wasn't new to me since I've been doing it for years, it's still reassuring to hear that other webmasters have the same problems I do. Chris told us that he liked to search for his site in search engines to see who links to him and what people are saying about him. To his dismay, he discovered the Dutch hate him! Go figure. The panel provided tips on site design and hosting options as well as copyright issues. They encouraged people to provide original content and not just image galleries. Original content makes people keep coming back, but with image galleries (or music libraries) people look at the images once, perhaps download them locally, and never return. After the panel, I headed out to my car to get my costume and hauled it up to the con suite's staff room. It took me a while to put it on, but before long, Optimus Prime emerged! I wandered around the hotel dressed as Optimus Prime waving to people and posing for lots of pictures. Sadly, I don't have any pictures of myself. I had some trouble with the mouthpiece though... Because I was sweating heavily in the costume, my face was moist and the mouthpiece wouldn't stick to my chin like it should have. I managed to get by anyway and wandered around the hotel for about 45 minutes. Eventually, I had to give up. I couldn't stand the intense heat any longer. It also didn't help that I couldn't sit down while wearing the costume. ...and that's probably the shortest convention appearance of any costume anywhere. After getting back into normal clothes, wiping my face, and grabbing a Capri Sun, I went out and took more photos and checked out what was happening around the con. I eventually made my way back upstairs to try my hand at karaoke by singing "Call Me, Call Me" from Cowboy Bebop. At 5:30, the "Gender Panel" started. 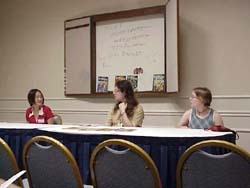 This panel was intended to discuss gender roles in anime as well as gender roles in fandom. 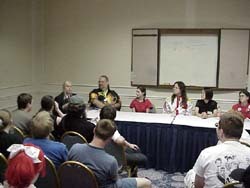 Judging from the turnout and the audience participation, this was one of the most popular panels of the convention. There wasn't an empty seat in the house. Unfortunately, there was a lot of cross-talk going on during the panel and people in the back had difficulty hearing what the panelists were saying at times, still it was an interesting panel. The only thing that they had to watch out for were the younger audience members and preventing the panel from degrading to just listing characters with gender issues with questions like, "How about Sailor Uranus and Sailor Neptune?" or "What about Ranma?" If there is a Mikkakan next year, I'm sure this panel will return. Immediately following the Gender Panel was the costume contest. Throughout the day, we realized we were going to have a problem with the contest. There were over 300 people there and the room only sat about 125. What could we do? Remove the chairs! We had the Youth entries come out and compete first so that they'd be able to be judged and go home to bed if they needed to. The judges' decision was split 2 to 2 and Mikka-chan had the two finalists hold a "cute off" and then let the audience's applause decide the winner. In retrospect, this wasn't a great idea. Oh well...it's our first time. The remainder of the cosplay went great. There were so many great entries that we had a tough time determining some of the winners. Unfortunately, there were some pauses after some performances while things got organized in the other room. The audience managed to find ways to entertain themselves. At one point, two girls near the front were singing so Tristan dragged them up in front of everyone and had them entertain the crowd. I don't have a complete list of who won what, but the winners consisted of Malice Mizer (Best of Show), the Gundam girls (Best Performance), the Kenshin group (Best Group), ? I forget ? (Best Walk-on), Princess Mononoke (Craftsmanship: Master), Chrono Cross (Craftsmanship: Journeyman), Captain Harlock (Craftsmanship: Novice), and honorable mentions to two Ryo-Ohkis, Sailor Moon, and others I can't recall. Mikkakan should have this info on their site soon and I'll update this once it is. The convention pretty much died down after the awards were announced. We went up to the con suite to hand out the prizes. Surprisingly, everyone seemed to go home happy with a prize that they liked. No arguments. We learned a lot from the cosplay and next year, assuming Mikkakan is a go, things will be bigger and better. I hung around pretty late on Saturday. I talked with people in the con suite and just hung out. Then Mike Ray and I wandered downstairs to see what was going on. We talked with some costumers sitting in the halls and relaxed. When some episodes of Trigun started up in a video room, some of us went in there. After two episodes, at about 2:30am, I decided to start the 45 minute drive home.